Cross Platform Mobile Study Aid! "I am a professional student and it has made my studying a lot easier." "This app just continues to impress more every day. Letting the kids use for study too!" 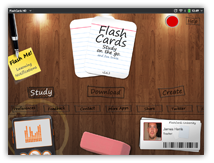 The award winning app, FlashCards, is back with an updated and fresh interface for tablet devices. Now customize your desk and study methods to maximize your learning. The best part? FlashCards just keeps growing. This latest update will allow us to evolve the app much faster. 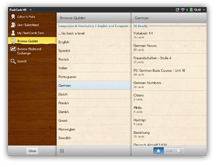 FlashCards is in the process of being ported to several different mobile platforms and for your desktop. Check out the platforms we're currently available for on the right.